Environmental researchers are using Tinytag data loggers to monitor the nesting site temperatures of various species of Arctic bird. Recording nest temperature provides data used to help understand the breeding strategies and outcomes of shorebirds in the Arctic. Tinytag data loggers are being used in the Arctic to monitor the nest temperature of breeding shorebirds. Robust Plus 2 TGP-4020 data loggers used with thermistor probes will be located at 11 sites in 2016 throughout Greenland, Canada, Alaska, Sweden and Russia, using a total of over 300 loggers. Several hundreds of nests have already been monitored in Greenland and Canada in previous years. The researchers are focusing on small shorebirds, also called 'sandpipers', and especially 'Dunlins' and 'Sanderlings' in Greenland. Dr Olivier Gilg, Associate Researcher at the University of Bourgogne (Dijon, France) and Chairman of the Arctic Ecology Research Group (GREA, France) is coordinating the Team using the Tinytags. He comments, "A colleague started using the Tinytags in Greenland in 2007 and they have many advantages over the traditional and time consuming visual observations we did before." The probe is placed between the four eggs (the shorebirds studied lay four, or more rarely three eggs) with the Plus 2 logger itself hidden about 50cm away: when the bird sits on the nest nothing is visible. The loggers are set to record once per minute, enabling monitoring for the entire three week incubation period, compared to traditional studies when it was necessary to spend time walking long distances every one or two days to check the fate of the nest. This also allows the Team more time to find additional nests, and more importantly, reduces disturbance including predation risk because foxes, raven and other 'egg lovers' can sometime follow the researchers' tracks to find the nests! There are several key pieces of information that the Team can learn from the recorded data, using a standardized method for all sites. Firstly, they can document the outcome of the nest and primarily, the date of this outcome: if the nest produces young then the temperature declines and becomes more chaotic for 24h before it is left (young birds are drying for around 24 hours after hatching before they leave the nest). If the nest falls victim to predators, the temperature drops dramatically from one minute to the next since the nest is abandoned and the birds do not come back to incubate an empty nest. For species with different breeding strategies (either one or two adults incubating), the recorded data provides details about this strategy: if there are two birds, they take turns and the temperature drops only for short periods; if one bird incubates alone then it has to feed, mainly between 9am and 5pm for around 10 minutes in every 30, and the temperature will fluctuate. Finally, using spreadsheet filters developed by Dr. Gilg and colleagues, the number of recesses (periods when the nest is not incubated) per day can automatically be extracted along with the total daily duration of these recesses. This allows the researchers to test other ecological hypothesis related to predation: e.g. birds that are leaving the nest more often or longer should be more impacted by predation. And because other information is available about these birds (their history in some cases; their body conditions in most cases; their wintering grounds eventually using isotopic concentration of winter grown feathers, etc. ), it is possible to understand how all these parameters impact (or not) upon their breeding success. Dr. Gilg concludes, "Compared to previous methods requiring regular visits, the Tinytags allow us to collect a large amount of accurate data, and also reduces the disturbance of the birds and the predation risk. Placing the logger in the nest only takes a few minutes (once) and it will then continue to record data during the entire incubation period." 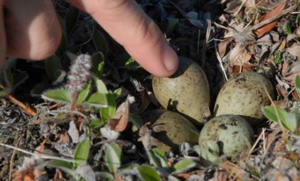 The image shows 4 eggs with one probe in the middle in a Sanderling nest, from NE Greenland.